Metro’s Twitter account for service alerts, @MetroLAalerts, has been around since the beginning of this year and provides daily updates on rail and bus service issues throughout the Metro system. Unlike the more generalized @MetroLosAngeles Twitter, @MetroLAalerts is reserved strictly for service updates. Despite the potential usefulness of @MetroLAalerts, the account has only managed to acquire just short of 1,000 followers – a drop in the bucket when compared to Metro’s overall bus and rail ridership. Earlier this week a reader mentioned the this could be due to a lack of marketing – and I agree – but promotion aside I think many people think they need to be connected to web or own a smart phone to take advantage of Metro’s service tweets. Fortunately, Twitter is more versatile than that – all you really need to receive service alerts while on the go is a mobile phone capable of receiving SMS (text) messages. 2. You will receive a text message from Twitter asking you to either sign up or enter your current Twitter username and password. 3. After your account is set up for SMS alerts, text either ON metrolaalerts -or- FOLLOW metrolaalerts to 40404. 4. You will now receive text messages to your device whenever @MetroLAalerts updates (be aware of your mobile carrier’s text message plan, each tweet is treated as a standard text message). 5. 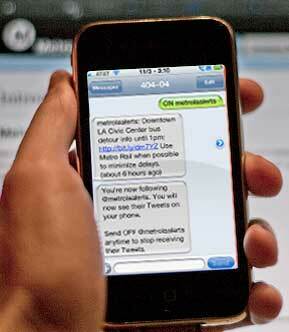 To turn off @MetroLAalerts text messages, text either OFF metrolaalerts -or- LEAVE metrolaalerts to 40404. No smart phone or pricey mobile web plan needed – just your basic cell phone, an SMS plan and this guide and you’re on your way to taking advantage of @MetroLAalerts. I just signed up for alerts and I know it will come in handy. Thanks for the information. One way this service could be much more useful is if users can subscribe to certain lines that will affect them. I take only the Silver Line and it would be nice not getting a bunch of texts on irrelevant alerts (especially for things like Gold/Blue Line maintenance that goes on nightly). Customized alerts would also come in very handy before I get on the bus (not while standing and waiting for the bus, or after getting on the bus, finding out that there’ll be a detour). It would be nice to receive updates on specific bus routes. I ride the 549 from Sherman Oaks to Burbank. it is on time some days and up to 20 minutes late on other days. The elevator is out at the Highland/Hollywood station. The escalator is out at blank station. The escalator has been repaired at blank station. Thanks Alicia. We’ll pass your comment on. I think an escalator/elevator specific service alerts account is a good idea, personally.